As far back as I can remember, I was active. I was running to my parents, away from them, running around with friends, you get the idea. I participated in cross country as a young child through middle school. When high school came, I was burnt out of endurance running so I participated in track & field. 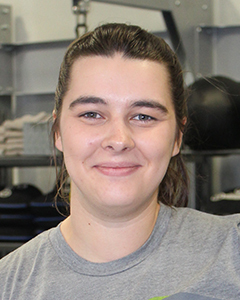 In college, I decided to pursue exercise science because of my love for helping people and the possibility of helping my family now and in the future. During the start of my sophomore year, I applied to The University of Akron’s Student Recreation and Wellness Center. I was not hired as a personal trainer, group exercise instructor, or wellness floor attendant but as an intramural official and scorekeeper. I donned the stripes and officiated all kinds of sports such as flag football, basketball, volleyball (indoor and sand), kin-ball, wiffle ball, floor hockey, and dodgeball. You never realize how hard officials work, physically and mentally, in their respective sports until you are in their shoes. Through intramural officiating, I found a deeper love for fitness. I acquired my personal training certification after college and worked for the YMCA in downtown Canton. I taught small group strength training sessions and TRX classes along with my personal training clients. My favorite part was coaching members on the exercise equipment or showing exercises, especially if they were new members of the facility. The director helped me spread my wings in the fitness world and expand my knowledge about high intensity interval training and suspension training. A need for full-time benefits in 2018 caused me to put a pause on training and started a new venture in the pharmacy world. Learning something brand new was enjoyable but the amount of hours and stress took a toll on my body that was once very active. At the beginning of 2019, the pharmacy sold its stores to a larger company and I was out of a job and benefits. A friend reminded me I maintained my personal training certification and in that moment I realized I could return to training to regain my health and wellness and rekindle the flame of coaching others. “An object at rest stays at rest and an object in motion stays in motion with the same speed and in the same direction unless acted upon by an unbalanced force.” and returning to personal training is just beginning. With my unique experiences, I hope to share my knowledge of fitness and wellness to my clients and assist them in achieving their goals and living a full life.